To make a fence secure for cattle you need at least two rows in the fence. Depending on the risk, additional rows may be necessary. For cows we recommend having 2 fence rows set at a heights of around 60 and 90 cm. For bulls, mothers with calves and heavy breeds we recommend having 3 fence rows set at a heights of around 45, 75 and 105 cm. Place fence posts every 4–5 m. Robust plastic posts make excellent mobile fence posts and line posts. These are easy to install, inexpensive and versatile. For 2 fence rows we recommend the high-quality "Limit 110" high-quality electric fence post for horses, item no. 42171. If you would like to use 3 rows, then the 125 cm plastic posts, item 44458, are well suited. To ensure sufficient stability in your fence system you should place solid wooden or metal posts at all corners and gates as well as every 40–50 m along an electric tape fence and every 70–80 m along electric rope fences. The Allround metal posts, item no. 44387 or our Octo-Wood wooden posts are particularly good choices (e.g. item no. 44827.10). Conducting materials should be chosen based upon the length of the fence. The longer the fence, the higher the quality (conductivity) of the conducting material required. This is the only way to be certain that sufficient voltage will be available at the end of the fence to make it effective. 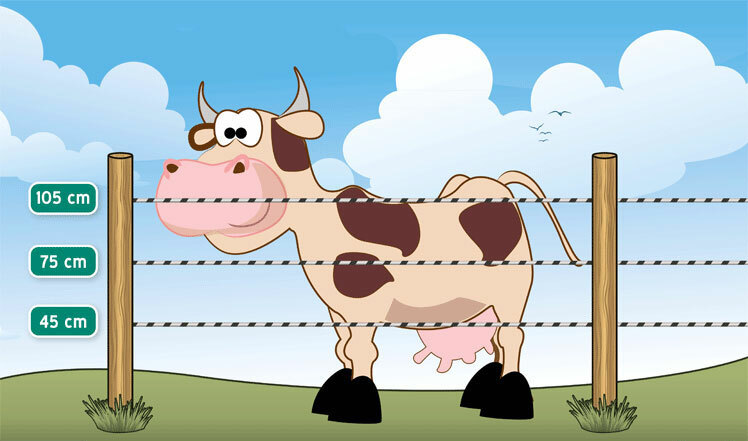 Suitable materials for keeping cows are electric polywire, electric rope and electric tape. Electric polywire is particularly simple to handle and is long-lasting. For simple medium-length fences, electric fence polywire item 44613 with a resistance of 3.45 ohm/m is best suited. It has 7 rust-proof high-grade steel conductors running through it and is extremely tough. For longer fences, an even more high-quality wire with an even lower resistance is required. Low quality rope will mean that a large amount of voltage is lost over the longer distance, leaving insufficient voltage at the end of the fence. We therefore recommend a highly conductive polywire from our TLD series, such as item no. 42402, or our premium green/white electric fence polywire with 3 x 0.25 copper and 3 x 0.2 stainless steel conductors (item no. 44645). Due to its high visibility and low risk of injury, electric ropes or tapes are preferred conducting materials to use with cattle. Electric ropes should have a diameter of 6 mm or 8 mm. These are not affected by the wind, can be pulled taut and look good. A simple electric rope with a resistance of 3.45 ohm/m should suffice for a shorter fence (up to about 200 m), e.g. electric fence rope 200 m, 6 mm, white, 7 x 0.2 stainless steel (item no. 44160). For fences longer than this, a high-quality electric rope (low resistance of 0.07–0.104 ohm/m) should be used. Low quality rope will mean that a large amount of voltage is lost over the longer distance, leaving insufficient voltage at the end of the fence. We recommend our highly conductive TLD series electric fence rope, e.g. Rope 200 m, 6 x 0.25 (item no. 42390), or for particularly high demands, the electric fence rope 3 x 0.3 copper + 3 x 0.3 stainless steel (item no. 44569). Electric tape for cattle should be 10–40 mm wide. As with electric ropes, the quality of tape required is decided by the length of the fence. The inexpensive electric fence tape 200 m, 20 mm, 5 x 0.16 stainless steel (item no. 44140) is sufficient for short fences (up to about 200 m). Longer fences require a higher quality tape (quality A or B) to ensure there is still sufficient voltage at the far end of the fence. For this we recommend, for example, the 10 mm TLD tape, 200 m, 4x 0.25 (item no. 42420) or, for very long fence systems, the 200 m electric fence tape, 40 mm, 4x 0.3 copper + 6 x 0.3 stainless steel (item no. 44675). The "Turn 1000" plastic reel will be a useful tool for winding and unwinding wires, ropes and tapes (item no. 44270 and 44271). For particularly long stretches of fence, the "Max TURN 2000" is the reel of choice (item no. 44238 and 44239). The quality of our conducting materials is graded on a scale from A (top premium quality) to E (basic quality). The lower the resistance of the material, the better the current can be transported along the fence without any losses. Using high-quality conducting materials (stainless steel, TLD, copper) and a high number of conducting lines, the electric resistance can be reduced and thus improve the conductivity of the material. The fence voltage should always be adapted to the individual level of risk (animal temperament, location of the pasture). Generally, we recommend a fence voltage of at least 3,000 V for cattle fences. If a connection to mains power is available (even if it's up to 200 m away), then a 230 V mains energiser is preferred. Mains energisers are available in different performance categories. Even for long fences with a lot of vegetation and animals that are difficult to keep, these will provide sufficient energy and are therefore also suitable for complex fences. A very reliable and versatile energiser for cattle is the Voss.farming Tesla 7 (item no. 43825). This is also suitable for long stretches of fence where vegetation is present and has an excellent price-performance ratio. Where the demands are particularly high, the Nvi 9000 (item no. 44869) is the best choice. This is also suitable for the most difficult fence and soil conditions, improves performance in the presence of vegetation and has an alarm mode. Even very long stretches of fence are no issue for this energiser! install a ground fault circuit breaker before your electric fence's mains energiser to prevent electrical accidents (item no. 48015). If no mains connection is available to you, then you can use a 12 V or 9 V battery unit. Additional use of solar panels will save time and money and perfectly complements your 9 V battery-powered energiser or 12 V battery unit. The 9 V Extrapower (item no. 42011) is suitable for mobile use and in small pastures. It is also good for separating off individual areas of the pasture and comes with a 55 Ah battery included. For larger fences or more wild animals, we recommend the stronger "9 V BV 3900 incl. 130 Ah battery" energiser (item no. 42031). The 12 V Voss.farming Sirus 8 (item no. 43805) energiser will meet the highest of demands. It stands out for its incredible quality, performance and safety and is excellently suited to more difficult fencing. A more modern approach makes use of solar panels for powering the electric fence. Using solar panels means you don't need to waste time with frequent battery changes and it is an environmentally friendly, low maintenance and affordable way to power your 12 V energiser. A complete kit (item no. 43662) that includes the reliable 12 V Green Energy battery energiser, metal case and solar panel is available for a great price. The grounding for any electric fence system is extremely important. Smooth operation of the electric fence system can only be ensured if the grounding has been carefully installed. You should use galvanised rust-free steel poles with a large surface area to make an optimal electrical contact with the ground. For permanent systems, the 1 m long special grounding post with angled profile, item no. 44219 is ideal. For mobile use, we recommend the practical special grounding post with a round profile, item no. 44375.
the grounding can be checked using a fence tester (item no. 44863). A bypass must first be created. To do this, place iron stakes (or similarly conductive material) into the ground that is in direct contact with the conductive fence materials around 100 m from the energiser. The fence voltage should then drop to around 2000 volts. Now insert the metal rod of the tester into the ground around 1 m from the last grounding post of the energiser and hold the tip of the tester against the grounding post. A reading of 0–200 V indicates that the grounding is good. Voltage readings between 200 and 600 V are within the tolerance range. If you have a value over 600 V it will be necessary to improve the grounding by installing an additional grounding stake in order to ensure sufficient voltage on the fence. 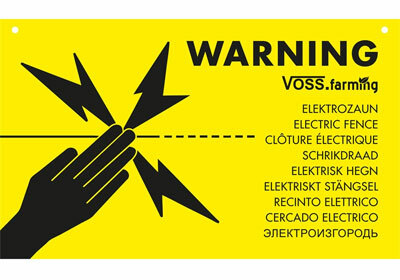 The best conducting material and the most powerful energiser is no use at all if the electrical connections are not properly made. You should use an electrically conducting fence connection cable to properly connect the energiser to the electric fence. E.g. polywire connection cable (item no. 44612), tape connection cable stainless high-grade steel (item no. 44212) or rope connection cable (item no. 44512). To properly connect the fence rows to each other use a tape connection cable (item no. 44213) or rope connection cable (item no. 44513). Use a lead out cable, item no. 33615, to connect the grounding. Conducting material should never be knotted as this will reduce its conductivity. In the event that your tape or rope breaks or for attaching it at the start and end of the fence, you should always use electrically conducting connectors such as the rope connector, item no. 44616 and 44620, tape connector, item no. 44660 or the high-grade steel plate set for tapes, item no. 44579. Lightning protection equipment is designed to prevent lightning strikes from damaging the energiser. The compact lightning protection (item no. 44755) guides the lightning strike down into the ground and can be easily installed into existing fence system, thus fulfilling the regulations as required by insurers. during storms, electric fences are at a quite high risk of being struck by lightning. Without lightning protection, this strike, which can be many millions of volts, travels through the conducting material, via the fence connectors and into the energiser. This energiser is then destroyed. If the energiser is also connected into the mains supply in a stable or similar, the strike can continue into the electricity supply lines and cause an electrical fire in the building. For this reason, regulations forbid the indoor installation of energisers without lightning protection. For a pasture gate, you can use a solid metal gate such as the galvanised electric fence gate, item no. 44789. To increase the safety of a metal gate, they can be easily electrified using our electrification sets for pasture gates (item no. 44441). You can also quickly and easily create a gate using our gate handle with elastic rope kit (item 44434). A flexible gate system (item no. 44935) is very practical and simple to set up. When the gate is opened the rope or tape is automatically rolled up. This means it always stays clean, leaves no danger of tripping and the gate handle won't be left lying around on the ground. If you wish to have your electric fence system fully locked down then we recommend the locking gate handle system (item no. 44419). Some insurers will only provide insurance for damages if you have installed gate security such as this. It is a legal requirement that you conduct regular checks of your electric fence system. A simple check can be done using a fence tester with digital display, item no. 44863. A fence switch is extremely handy in situations in which the fence requires any repair work. These save you the time of having to make a long walk to the mains energiser to turn it off. The robust green fence switch (item no. 44767) allows you to turn off the voltage to individual sections of fence and safely repair the fault.